Do you really need a sign that you have cracked a tooth? You might not think so, but having a cracked tooth is not as obvious as you would think. In fact, many people are unaware that they have a cracked tooth until they go to the dentist for a normal checkup. A cracked tooth is a serious dental concern that needs to be addressed as soon as possible because there are serious repercussions that can occur if it is not. Pain – Any type of pain in the teeth or mouth is a serious cause of concern. 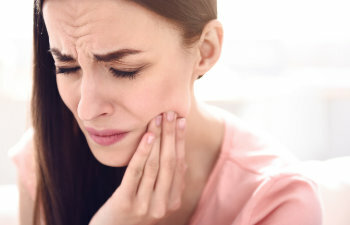 Tooth pain does not always mean that a tooth is cracked, but it is a tell-tale sign that something is wrong in the mouth. A cracked tooth can cause sharp or dull pain when chewing or drinking. Pain is most noticeable when eating harder foods such as candy, chewing tough meat, or drinking hot or cold beverages. These foods can put pressure on the damaged tooth or their temperatures can enter inside the crack and touch the tooth root. Cosmetic appearance – Many cracks in the teeth are not visible to the naked eye; they are extremely small and often require an X-ray to be seen. However, there are some obvious signs: a dark line in a tooth, discoloration in a single tooth, visible chips, or the transparency within a tooth. It is important to take the time to examine your teeth every so often to be aware of any changes in your teeth. Any time there is a crack in the tooth, it needs to be addressed by your dentist. Depending on the severity of the damage, cracked teeth can be restored with fillings, a dental crown, or a veneer. In some instances, severe tooth cracks may require root canal therapy or even an extraction. However, cracks that are caught early can be treated and the tooth can be saved in most cases. Preventing cracks in the teeth is possible. It is important to avoid cracking down on pieces of ice and hard candies, to avoid biting the nails, and using protective mouth guards when playing sports. If you are worried that you may have a cracked tooth, contact Gold Hill Dentistry today. We offer exceptional dental care to patients of all ages, and we would be proud to serve you.